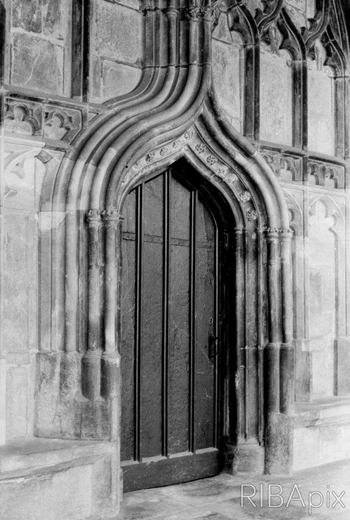 An ‘ogee’ is a double-continuous S-shaped curve found in medieval buildings throughout Europe and much of the Islamic world. It is one of the oldest elements in architecture. Both strong and appealingly decorative in its curving structure, it is a load-bearing feature that tests the toughness of a gentle, delicate form. Yun Kyung Jeong’s paintings are filled with energy and propelled by forms that are closely related to this Gothic ogee. In Jeong’s paintings the controlled and calibrated play between positive and negative space is often dynamic and stimulatingly unexpected, as the eye follows fragments of directional solids that push, pull, glide, drive and glide across expanses of canvas as though they were creatures in search of new territory, on a nomadic pilgrimage across an unknown wilderness. Jeong’s work is founded on her mastery of an alluring and ambiguous abstract shape, whose character – and it is characterful, almost mischievous – appears in the many natural guises of feather, flame, leaf, window, cell, scale, and wall. Arguably this little form is a symbol of vitality itself. This element, which for the purposes of this essay I identify closely with the ogee in reference to a transnational history of Gothic architecture, fractures the smooth two-dimensional plane of the canvas or silk surface and creates spaces of engrossing depth. Openings, windows, frames, and the precarious development of semi-solid forms are suggestive of fantastical utopian architecture. These ogee brush strokes are airily flexible in some states, and persistently fiery and emboldened in others. They are gestures that blend medievalism and modernism into a seamlessly energetic fusion. They read as a force with which Jeong must reckon in each artwork in order to harness the energy – whether gentle or raging – that they offer. Jeong’s In-Sync IV weaves forms that undulate across a spectrum regulated by tight control and a fluid mark-making that appears to court chance. There is chaos buzzing on the edges of a surface whose centre is marked by Jeong’s characteristic ogee elements as they flit and double back on themselves in an array of angles and curves. In the 1940s, the British artist John Piper was one of many who were invited to take the Second World War as their subject, painting fragments of bombed buildings and creating interpretations as well as visual records of life lived in the midst of international conflict. His bright palette contrasts with passages of charred blacks and greys that pick out the blown out windows of domestic and sacred spaces. His Coventry Cathedral is one of the most famous paintings in this series, capturing the fragility of perfect Gothic pinnacles reaching upwards in the aftermath of an explosion that left this grand and holy architecture as nothing more than a ruined shell. For Piper, as for many artists across centuries, the ruin had an elusive and melancholy beauty. In The Pleasure of Ruins, Rose Macaulay wrote about buildings that were somehow more beautiful when violence exposed their decorative interiors and these spaces were destructively reduced to strange sculptures piercing the air: ‘What was last week a drab little house has become a steep flight of stairs winding up in the open…undaunted, to the roofless summit where it meets the sky.’ Jeong’s In-Sync IV combines the glorious bursting freedom of utopian idealism with the intimation of beautiful decay and the uncanny emotional tinges of destruction. For Blake, this visionary tiger emerges from a void to remind him that all creatures are divine, and all may be both threatening and beautiful at once. Jeong’s ogee forms are simultaneously wings, flames, and feathers, suspended between the flicker of life’s directional intensity and a perpetual slippage into a simple, serene and powerful promise of silent emptiness. 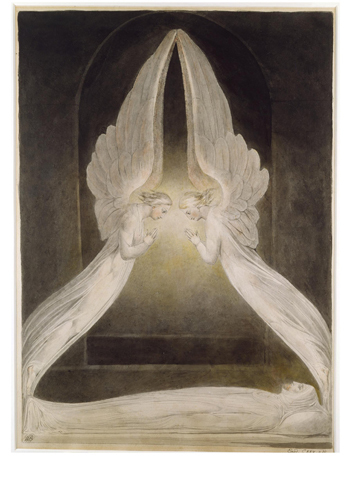 The solemnity of Blake’s angels, thin as watercolour’s contact with paper, their wings forming architectural thresholds, provides a boundary between order and disorder, as well as creating a fusion between the tangible and the intangible. Jeong’s paintings inherit this strange Gothic legacy, manipulating the wing-like elements of flight until they are a truly abstract set of characters in a constantly shifting art world. Solid and void are often in dialogue with the oppositional forces of structure and chaos in Jeong’s paintings. In Pond IV the flame-like ogee curves its delicate breaths in a dance-like pattern that breaks the boundaries of its tentatively established rhythms, only to surge towards a liquid wilderness. Tangy blue balances loose slashes of ruddy orange, which is applied over the upward-pointing ogee tufts of fire-breath, controlled yet on the move. In Jeong’s spatial flow, there is always – even at its wildest point – an indication of architectural possibility, as though each canvas Jeong paints might constitute the plan of a fantastical pavilion or city. In 1911, the German sociologist Georg Simmel suggested that ‘Architecture is the only art in which the great struggle between the will of the spirit and the necessity of nature issues into real peace in which the soul, in its upward striving and nature in its gravity are held in balance.’ Jeong’s paintings present viewers with a series of pre-lapsarian dreams in which new kinds of balancing acts are attempted and performed. Her paintings explore chaos and order, absence and presence, and – most importantly – the prospect of utopian landscapes within the limitations of a simple yet powerful fragment. The mighty flame, the gentle breath, the air-beaten wing: these are the elements contained and liberated in Jeong’s refined, contemporary deployment of an endlessly fruitful Gothic architectural archetype: the curving ogee arch. Rose Macaulay, The Pleasure of Ruins, 1984, p. 454. William Blake, ‘The Tyger’, Songs of Innocence and Experience, 1794. Georg Simmel, ‘The Ruin’, in Essays on Sociology, Philosophy and Aesthetics, ed. Kurt H. Wolff, 1965, p. 259.